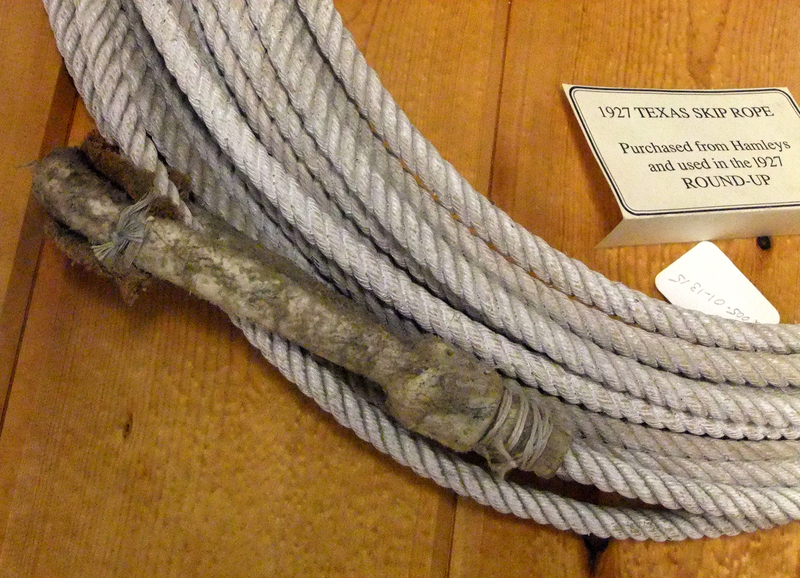 May 15, 2013 — Montie Montana used this Texas skip rope (used for rope tricks) in the 1927 Pendleton Round-Up — his first appearance at Pendleton. He purchased the rope from Hamley & Co., a maker of harnesses and fine saddles in Pendleton, Ore.
On display at the Pendleton Round-Up and Happy Canyon Hall of Fame Museum. Donated to the museum by Montie's family for permanent display. Nothing says "rodeo" like Oregon's Pendleton Round-Up, and nothing says "Pendleton Round-Up" quite like Montie Montana. Born in 1910, Montie won a spot in the Round-Up 17 years later with the rope tricks he'd perfected as a traveling performer with his parents, Edgar and Edna Mickel, who had a whip act. Montie was a regular at the Round-Up throughout the 1930s and 1940s and returned in 1975 to serve as grand marshal of the Westward Ho! Parade. "No Round-Up performer did more with a rope and a smile than Montie Montana," says the 100th anniversary anthology of the Round-Up, published in 2010 (Pendleton Round-Up at 100:115). In 1976, Montie sold the ranch he'd owned for 30 years at Devonshire Downs in Northridge and bought a new ranch next to Vasquez Rocks in Agua Dulce, becoming a Santa Clarita Valley resident — although he was no stranger to Newhall and Saugus, having performed in local rodeos at least as early as 1931. In his later years he continued to be a fan favorite, appearing everywhere from Newhall Fourth of July Parades and the Pasadena Tournament of Roses Parade (an unprecedented 60 consecutive times) to Pendleton, where he was inducted into the Round-Up and Happy Canyon Hall of Fame in 1980. A year before his death in 1998 he made his last Pendleton appearance. "He rode in the Westward Ho! Parade, performed at the Happy Canyon show to a standing ovation and judged the Indian Beauty Pageant, lassoing the winners." That was an easy trick for Montie; after all, he could "lasso ten running horses with a single loop of his rope." Montie made the National Cowboy Hall of Fame in Oklahoma City in 1989 and the Newhall Walk of Western Stars in 1992. He won a Golden Boot Award in 1992 and is also enshrined in the Salinas Rodeo Hall of Fame and the Cheyenne Frontier Days Hall of Fame. Billed as the maker of "the finest saddles man could ride," Hamley's history in the United States starts in 1850 when William Hamley, descendant of generations of saddle and leather craftsmen in Cornwall, England, set up shop in Wisconsin. In 1883 his two sons, John James and Henry, established Hamley and Co. in South Dakota, then moved to Kendrick, Idaho. Henry died in 1894 and J.J. moved the company to Pendleton, Ore., in 1905. In 1910, J.J. helped organize the first Pendleton Round-Up and served as director for many years. In 1919 the company developed a standardized bronc saddle to better anchor the rider to his horse. It's still in use in rodeo competitions today. J.J. died in 1939 and his sons, David and Lester, took over the business. Following Lester's retirement, David sold the business in 1980. Under new ownership, the company continues to provide leather goods, metalwork and custom saddles created on site, as well as Western wear, accessories and fine art. Hamley and Co. provided more than 80 trophy saddles for the Pendleton Round-Up over the years. Born Owen H. Mickel, Montie (June 10, 1910 - May 20, 1998) traveled with his dad, E.O. [Edgar Owen] Mickel, and mother [Mary Edna Harlan Mickel]. Billed as the Montana Cowboys, they did whip and rope acts and put on a slide show about the American West. In 1929 while working the Buck Jones Wild West Show, the announcer could not remember his name, so he announced him as Montie from Montana, and as Montie tells us in his autobiography, "the crowd loved it and so did I." From then on he became known as Montie Montana. As a star of silver screen, stage and rodeo arena, Montie entertained audiences around the world for more than 70 years. 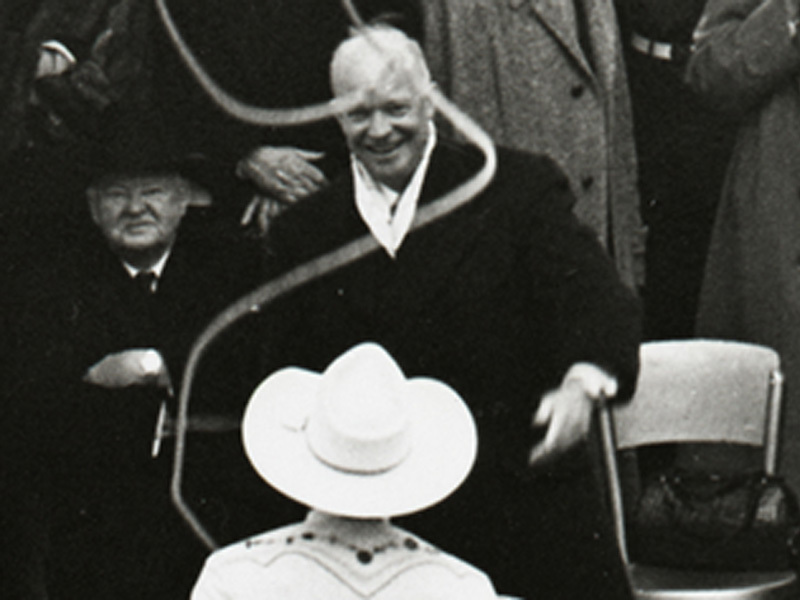 He rode in 60 consecutive Rose Parades and is famous for roping President Eisenhower in the 1953 Inaugural Parade. From 1945 to 1965 Montie thrilled over 8 million school children with his stagecoach and horse, Rex. Montie was famous for riding his horses into equally famous places such as the top of the Empire State Building, the Beverly Wilshire hotel in Beverly Hills, the Brown Palace in Denver, the Broadmoor in Colorado Springs and top-level government offices across the country. Though he received hundreds of awards and honors during his extraordinary lifetime, he remained a cowboy at heart. Montie was deeply grateful that he could make a living doing what he loved best — and it showed. He had the most wonderful laugh and was always smiling. An avid collector of Western artifacts, he kept treasures from early on in his career and enjoyed them throughout his life. His legacy will live on with the stories captured in this autobiography where he tells us that he lived in a great era, from the horse and buggy to the space age. Although he has ridden on ahead, I know that he's in tall cotton with other great Western heroes up there and that his horses are knee deep in green pastures and that he's still a cowboy, because he always said, "I must have been born a cowboy because I've never thought of being anything else." Further reading: Read more about Montie Montana here. LW2563b: 19200 dpi jpeg from digital image by Leon Worden.